Since its introduction in 1974, over 1 million examples of the iconic and luxurious Honda Goldwing have been produced from their plant in Ohio. Although the styling continues to evolve, and the bike has been updated over the years, is there still life in Honda's popular and ever evolving motorcycle? The current model of the Honda Goldwing is the GL1800. It’s a one of the most luxurious ways to ride. Tireless performance and minimal noise are provided by the fuel-injected flat-six and the wind deflecting fairing and large carrying capacity help to make this one of the most user-friendly touring bikes on the market. High built quality and an excellent paint finish have always been features of the Goldwing range, but the latest incarnation benefits from revised exterior styling that increases aerodynamic performance. This aero package helps to craft a distinctive new look and provide better wind protection for the rider. Wind tunnel testing and Computational Fluid Dynamics (CFD) research have been used to create the new shape. This research is also responsible for air vents that reduce the build-up of negative pressure at the rear of the bike. The improvements in this area have led to better stability, which is also aided by enhancements to the front and rear suspension. With 150 litres of total luggage space, riders will have plenty of space to keep essentials. A surround sound audio system and iPod connection provide some creature comforts, and a fully-integrated navigation system can point the rider in the right direction. So how does it stack up to its competition? Over the last three decades many rivals have come and gone. 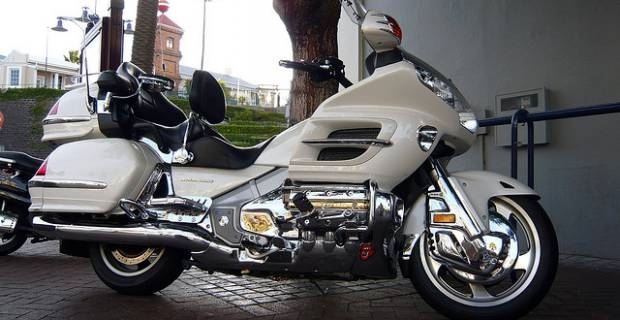 Today, modern tourers like the BMW K1600 offer sporting credentials that Honda Goldwing owners aren’t used to, but compromise a little of the comfort and long-distance luxury that the Goldwing offers. Some critics will tell you that it’s a little dated, but nothing on two wheels is as comfortable to ride as the Goldwing. Bennetts car insurance uk; fact or fiction?